After finally getting shut of the Business Meeting, I had a few hours of time to attend Worldcon. 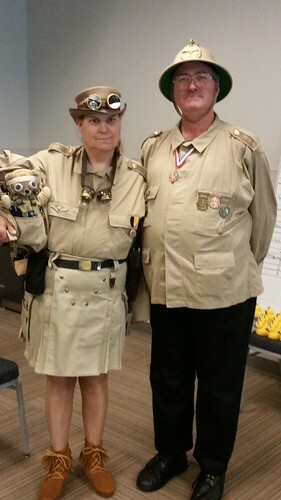 Private Kuma, Lt. Hayes, and Colonel Chinstrap found time to walk the floor of the convention for a while. While we were wandering the floor, we found Jesi Lipp at Site Selection. After checking to make sure it was okay with them, I gave Jesi a big hug and told her how proud I was of them in her first turn on the head table. I'm pretty much the person who recruited them to "WSFS Business Meeting Fandom" and worked on a "career development" path, much as we've been doing with Jared Dashoff. Jesi then did me the honor of asking me to be deputy Presiding Officer, and I accepted. 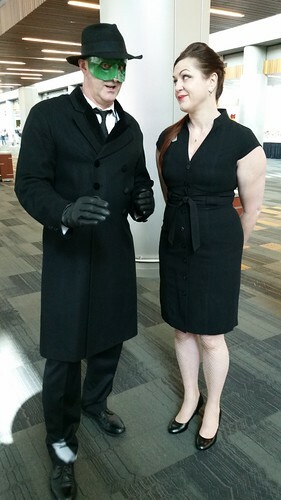 We ran into The Green Hornet and his companion. We also saw a bunch more great costumes, but I was not quick enough on the camera. We didn't have a lot of time to ourselves, and Lisa's feet were howling from the hard concrete floors, so we changed out of our costumes and I went off to help count Site Selection ballots. The full results will be in the Worldcon 76 newsletter and are not official until received by Sunday's Business Meeting, but there were no surprises in the vote tally for the two uncontested races. Lisa turned in early — I can't blame her for that, as she's been working very hard — and I didn't have a whole lot of energy myself. 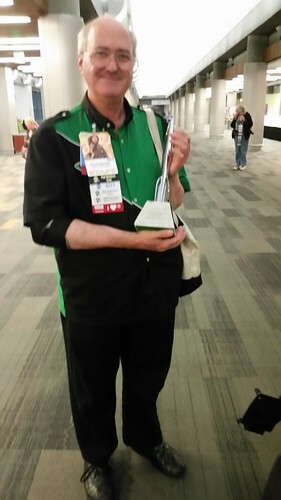 I ran across Tim Illingworth, who let me hold a piece of Worldcon history: the 1987 1986 Hugo Award for Best Professional Editor presented to Judy-Lynn del Rey posthumously but rejected by Lester del Rey. 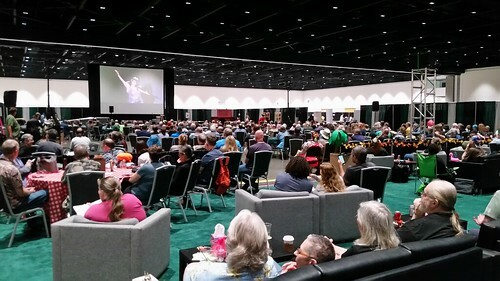 I did not attend the Masquerade in the Grand Ballroom, but instead sat in Callahan's Place in the exhibit hall, where we event was shown on the big screen. I watched Chris Garcia host the event, but did not stick around for the winners. I headed back to the hotel room, where Lisa had been trying to sleep. I hope I haven't disturbed her too much. I hope to get some sleep soon myself, but I know from experience that if I don't write these posts as soon as I can, I never will. And at that, I'm leaving out some other good stories from a packed day that I simply don't have enough time to tell them all. It was a long middle day of Worldcon, but a good one.